I watched Grease the other day and it gave me a wonderful idea. Annie and I could be Pink Ladies! Annie failed at Princess training but I think she will be a great Pink Lady. The jacket already looks divine on her! I will be the leading lady of course. So I will get the boy and go for a ride in the cool car. Maybe some whistles too from the boys! BearHUG & RosyPoodleKisses! Rosy, you come up with so many creative ideas for you & Annie. You both look lovely in pink & will be terrific Pink Ladies. Thanks! She finally likes something pink! BearHUG & RosyPoodleKisses! Yes! This reminds me of one of my all-time favorite movies, Pretty in Pink with Molly Ringwald. But in yours and Annie's case, I would change the name to Fabulous in Pink! Thanks!!! Fabulous in Pink ! That would be a great name for my movie debut - a girl can dream cant she?. BearHUG & RosyPoodleKisses! I love this!! You look awesome and pawsome!! Pink Ladies Rule!! Thanks!! Well I rule, cause I am the Pink Lady Princess ! BearHUG & RosyPoodleKisses! I want to be Sandy , but I look more like Rizzo. So I guess that would make me Rozzo? BearHUG and RosyPoodleKisses x8+2 ! Of course you will get the guy with the cool car, Rosy! 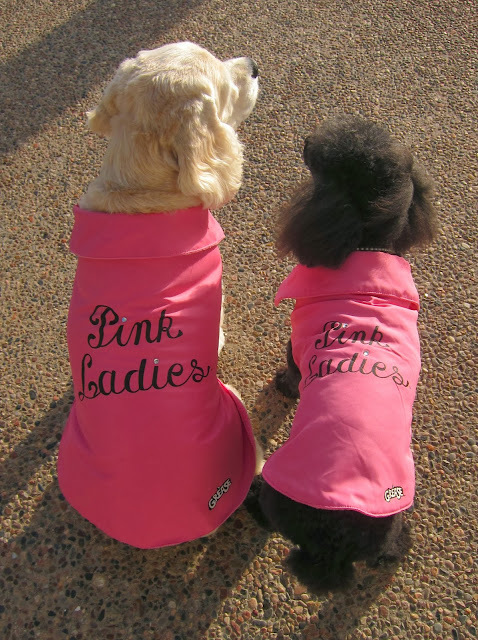 You guys both look so cute in your pink ladies fleece. Thanks Tikka -- I wish you could join us . Would you wear a Pink Lady jacket. It would look fab against your orange fur! BearHUG & RosyPoodleKisses!